Er möguleiki að sjálfstætt net brauta, alveg óháð öðrum umferðarmannvirkjum, gæti þjónað almenningssamgöngum í heild sinni á öllu höfuðborgarsvæðinu ásamt Suðurnesjum að verulegu leyti? Í þéttbýli væri netið að mestu leyti jarðlægt, aðallega í göngum og þó einnig í stokkum, en á langleiðum um Suðurnes væru brautir yfirleitt yfirbyggðar. Allt netið væri því lokað og alveg óháð veðri og vindum. Berggrunnur höfuðborgarsvæðisins er talinn henta nokkuð vel til jarðgangagerðar. Göng netsins yrðu jafnframt um helmingi minni um sig en göng almennt á landinu enda væru vagnar mjórri og mun lægri en sem svarar hefðbundnum hámarksviðmiðunum og breidd brauta því að sama skapi lítil. Brautirnar væru yfirleitt tveggja akreina, malbikaðar, sléttar og misfellulausar, en farkostir tvenns konar, alsjálfvirkir og óháðir fastbundnu spori, sjálfkeyrandi og því án ökumanna – 20 til 25 manna áætlunarvagnar annars vegar, er gengju líkt og vagnar í metrókerfum, og 6 manna vagnar hins vegar er væru aðallega til sérferða að eigin vali, sem kallað er Personal Rapid Transit – PRT. Vagnarnir lytu heildarstjórn netmiðstöðvar er stýrði ferðum um netið með hliðsjón af álagi og þörf alla daga, allan sólarhringinn, árið um kring. Jarðbrautanetið leysti strætisvagnasamgöngur nær alfarið af hólmi á höfuðborgarsvæðinu og á Suðurnesjum og þjónaði jafnframt sem ein megin samgönguæð milli Keflavíkurflugvallar, Bláa lónsins og mest alls þéttbýlis á Suðurnesjum annars vegar og höfuðborgarsvæðisins hins vegar. 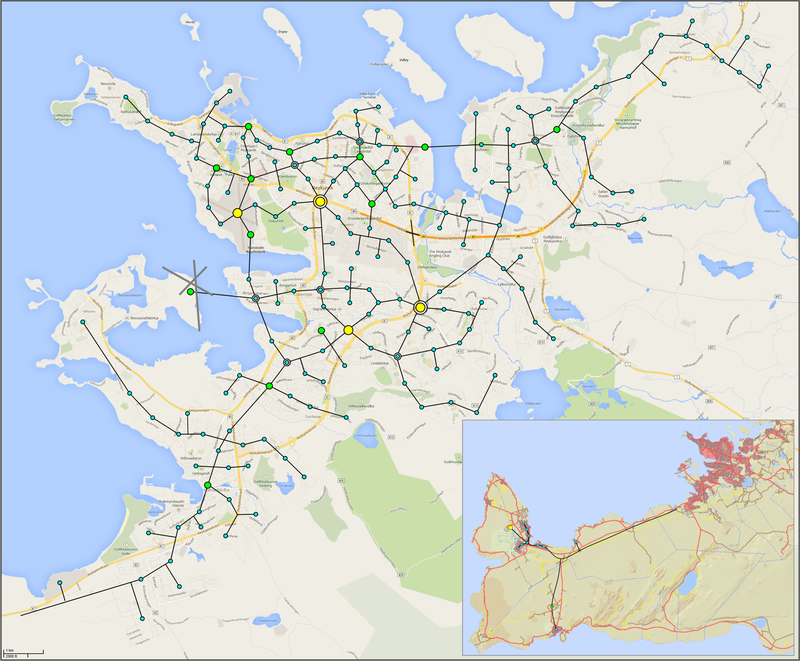 Is it possible that independent road network, completely free of other traffic infrastructure, could serve public transportation overall throughout the metropolitan area of Reykjavik along Reykjanes peninsula, including Keflavik Airport and The Blue Lagoon? In urban area the network would largely be underground, mainly in tunnels and also in channels, but on long routes on Reykjanes peninsula the lanes were usually overbuilt. Thus, the entire network would be closed and completely undependent of weather. The bedrock of the capital area, Reykjavik and around, is considered quite well suited for tunneling. The network's tunnels would also correspond to half the cross-section magnitude of what is generally referent in the country, as the coaches would be narrower and much lower than the conventional maximum frame, hence lanes would be consequently narrower. 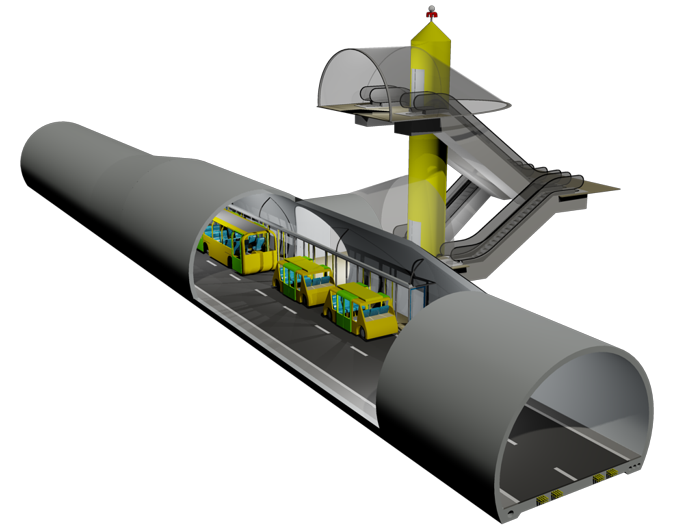 The pathway would generally be of two lanes, paved and smooth, but the vehicles would be of two types, fully automated and uncommitted of fixed track, and without drivers – on one hand 20 to 25 persons coaches serving mainly on schedule, like in metro systems, and on the other hand, vehicles for 6 persons, mainly for special tours, called Personal Rapid Transit – PRT. The self-driving cars would be controlled on behalf of the networks main center, with regard to rush hours and need every day, 24 hours round the clock, the whole year round. 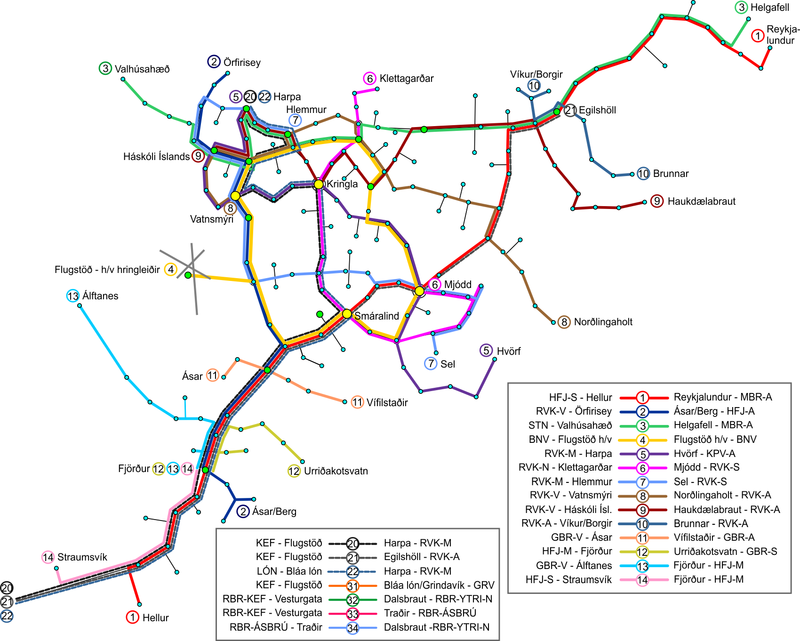 The network would almost entirely replace bus transportation in the Reykjavik metropolitan area and on the Reykjanes peninsula and also serve as one of the main transportation mode between Keflavik Airport, the Blue Lagoon and most of the urban areas in Reykjanes peninsula on one hand and the capital region on the other.